Rocking Z Guest Ranch has easy access. Located 26 miles north of Montana capital city, Helena, in our own little valley the Rocking Z Guest Ranch shares its occupation of the land with ranch activities that have been done by the Wirths for four generations. There is guided fly fishing available on the Missouri River below Holter Dam. There is fishing on Little Prickly Pear Creek on the ranch and lake fishing on Holter Lake, 9 miles away. 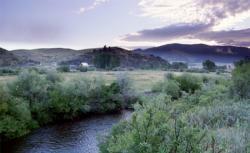 Let Dad fish while Mom and the kids go horseback riding or explore the Lewis & Clark Trail. This is the closest lodging to Gates of the Mountains, an important landmark named by Lewis and Clark. Spend a day enjoying Ulm-Pishkin Buffalo Jump and the Lewis & Clark Interpretive Center in Great Falls. Follow the path of Lewis & Clark in the boat trip at Gates of the Mountains. Enjoy the cliffs, wildlife, and solitude at the ranch. If riding is what you enjoy, this is a working cattle ranch. Ride through and chase the cows and calves. Many guided trail rides are available of varying lengths. Improve your riding skills and learn rodeo and gymkhana events on horses that know how to do it all. Expert help and horses. Mountain top excursions can be enjoyed by those who don't want an all day trail ride. Ride in the pickup and go to the top of the mountains where you can see over 100 miles and 6 mountain ranges! Learn all the area history. The Mullen Trail which was completed in 1856 goes through the ranch. General Sherman slept on the ranch in 1873 when investigating a murder done by renegade Blackfoot Indians. Area wildlife include mule deer, white-tail deer, elk, mountain lions, bears, bobcat, fox, coyote, skunks, porcupines, marmots, beaver, raccoons, chipmunks, and rabbits. Birds include Sandhill Cranes, bald and golden eagles, ravens, crows, magpies, rock doves, robins, gold finches, hummingbirds, bunting, curlews, blackbirds, killdeer, bank and cliff swallows, chickadees, sparrows, goldfinches, teals and ducks, blue herons, Canadian geese, owls and hawks. The ranch is located in prime big game hunting. It is surrounded by Sieben Ranch which is under Block Management Hunting by the Montana Fish Wildlife and Parks. This means that it is open to everyone to hunt on as long as you only drive on designated roads. We do not provide guiding, but do provide accommodations, map study and game retrieval. Fall is a beautiful time to enjoy the solitude, golden aspen, and cattle work. Great Divide ski area is only 13 miles away and is a great hill without the great expense. It has snow making equipment for the times our area doesn't get enough snow at the ranch, but that means that the horseback riding is still good. Christmas is a special time to bring your entire extended family. We will reserve the entire ranch for just one extended family. Grandma and grandpa, adults and grandchildren can get a Christmas tree on the ranch to decorate the lodge. Christmas shop in Helena where old cowhands wintered. Christmas church at any of the denominations in Helena. Christmas dinner and special memories of a real cowboy Christmas. Show off your new bridle. Christmas has always been special and we will make it special for our Christmas guests. Directions: Rocking Z Guest Ranch can be located from the Helena Airport by taking I-15 north 25 miles to Exit 216 - Sieben; go west (left) at the interchange; 1.8 miles on paved road. Ranch is on the right, across the creek. From the Great Falls Airport, take I-15 south 78 miles to Exit 216 - Sieben; go west at the Interchange, 1.8 miles on pavement. Ranch is on the right, across the creek. There is a sign on the road.